Diabetic nephropathy is one of the main long-term diabetic microangiopathies that can complicate type 1 and 2 and other secondary forms of diabetes mellitus, including posttransplant diabetes mellitus. Posttransplant diabetes mellitus was initially reported in the 1960s, with case reports of recurrent and de novo diabetic nephropathy after kidney transplant reported in the early 2000s, mostly as a result of same-risk and precipitating factors of diabetic nephropathy as in native kidneys. The disease may appear early in view of the hyperfiltration risk of being a single grafted kidney. Here, we discuss risk factors, early serologic and genetic biomarkers for early detection, and strategies to avoid and delay the progression of diabetic nephropathy after posttransplant diabetes mellitus. In this overview of published literatures, we searched PubMed and MEDLINE for all articles published in English language between January 1994 and July 2018. Included studies reported on the prevalence, incidence, or determinants of post-transplant diabetes among renal transplant recipients and studies reporting diabetic nephropathy in their cohorts. Our review showed that avoidance or good control of posttransplant diabetes is the cornerstone in management of posttransplant diabetes mellitus and hence diabetic nephropathy. Control and avoidance can be commenced in the preparatory stage before transplant using validated genetic markers that can predict posttransplant diabetes mellitus. The use of well-matched donors with tailored immunosuppression (using less diabetogenic agents and possibly steroid-free regimens) and lifestyle modifications are the best preventative strategies. Tight glycemic control, early introduction of angiotensin-converting enzyme inhibitors or angiotensin II receptor blockers, and possibly conversion to less diabetogenic regimens can help to delay progression of diabetic nephropathy. In this study, we reviewed the pathogenesis, stages, and diagnosis of DN after transplant, its epidemiology, clinical implications of PTDM, and new strategies for prevention and management of DN. The pathologic findings of DN after renal transplant are similar to those of typical DN in native kidneys, with thickening of the glomerular basement mem-brane and the tubular basement membrane as the first signs of DN followed by mesangial matrix expansion. Table 1 summarizes stages of DN and their clinical correlation. The extracellular matrix forms nodular mesangial changes, which gradually compress glomerular capillaries and lead to end-stage glomerular sclerosis, associated hyalinosis of afferent and efferent arterioles, and tubulointerstitial-related chronic changes.12 Diabetic nephropathy in the transplanted kidney is frequently associated with vascular and tubulointerstitial changes due to allograft rejection, viral infection, or calcineurin inhibitor (CNI) nephrotoxicity, which may help to distinguish it from DN in the native kidney. The circulating soluble urokinase plasminogen activator receptor (suPAR) has been shown to play a dynamic role in patients with DN.15 Increased suPAR serum levels cause podocyte apoptosis through its link with acid sphingomyelinase-like phosphodiesterase 3b on podocytes. In addition, suPAR was shown to be a predictor of proteinuria in patients with DM.16 Therefore, suPAR can be a novel approach to treat DN in native and perhaps in transplanted kidneys. The pathophysiology of PTDM has been shown to be similar to that of type 2 diabetes mellitus22 but can be complicated by both transplant-specific and nontransplant-related risk factors. The high incidence of de novo hyperglycemia immediately after transplant is high, which may be due to exposure of pancreatic β-cells to several stress factors, including the surgical procedure, weight gain due to physical inactivity immediately after surgery (insulin sensitivity), high doses of corticosteroids, and initiation of CNIs.23 Because PTDM is a serious complication in patients after renal transplant, identification of risk factors could help to prevent the condition. Role of new biomarkers in predicting and assessing the course of posttransplant diabetes mellitus Vattam and associates46 reported that the insulin-like growth factor 2 ApaI G allele could be used as a biomarker for identifying individuals at high risk of developing new-onset diabetes mellitus, especially in patients after renal transplant for appropriate management of immunosuppression, which could thus prevent the development of PTDM. Heldal and associates47 reported a strong association between PTDM and inflammatory biomarkers, including soluble tumor necrosis factor type 1 (P = .027), pentraxin 3 (P = .019), macrophage migration inhibitory factor (P = .024), and endothelial protein C receptor (P = .001). These associations suggested that these markers could be targets for future studies on pathogenesis and possibly treatment of PTDM.48 Tarnowski and associates49 suggested that the presence of some genetic variants with other inde-pendent risk factors of PTDM should be considered as a contraindication for strongly diabetogenic im-munosuppressive regimens. There is a need for large genome-wide association studies to identify the genetic risk factors associated with PTDM devel-opment. Vattam and colleagues50 reported that TCF7L2 and SLC30A8 polymorphisms could be used as biomarkers to identify individuals at high risk of developing PTDM, especially among Asian Indian populations. Wada and associates57 suggested urinary nephrin-to-creatinine ratio as a reliable marker for predicting the effectiveness of treatment. However, it will need validation regarding its efficacy, especially among children or adolescents with DN. Together, these studies suggest that measuring renal protective mediators such as ACE-2 along with urine levels of urinary liver-type fatty acid-binding protein, neutrophil gelatinase-associated lipocalin, and urinary kidney injury molecule-1 might provide prognostic information in DN. In studies with patients with type 2 diabetes, it was determined that disease-oriented education had a positive effect on self-care activities of patients.30-33 Other studies displayed decreased lipid levels and arterial blood pressure values in patients who were given education by diabetes nurse educators and monitored for approximately 3 months to 1 year.65,66 This approach can also control cardiovascular risk factors and improve related morbidities. Avoidance or good control of posttransplant diabetes is the cornerstone of management of PTDM and therefore DN. These measures may be commenced in the preparatory stage before transplant using validated genetic markers that can predict PTDM. The use of well-matched donors and tailoring of immunosuppression (using less diabetogenic agents and possibly steroid-free regimens) and lifestyle modification are the best preventive strategies. Tight glycemic control, early introduction of ACE inhibitors or angiotensin II receptor blockers, and possibly conversion to less diabetogenic regimens can help to delay progression of DN. Bhalla V, Nast CC, Stollenwerk N, et al. Recurrent and de novo diabetic nephropathy in renal allografts. Transplantation. 2003;75(1):66-71. Cole EH, Johnston O, Rose CL, Gill JS. Impact of acute rejection and new-onset diabetes on long-term transplant graft and patient survival. Clin J Am Soc Nephrol. 2008;3(3):814-821. Salifu MO, Nicastri AD, Markell MS, Ghali H, Sommer BG, Friedman EA. Allograft diabetic nephropathy may progress to end-stage renal disease. Pediatr Transplant. 2004;8(4):351-356. Cao Z, Cooper ME. Pathogenesis of diabetic nephropathy. J Diabetes Investig. 2011;2(4):243-247. Vinod PB. Pathophysiology of diabetic nephropathy. Clin Queries: Nephrol. 2012;1(2):121-126. Navarro-Gonzalez JF, Mora-Fernandez C. The role of inflammatory cytokines in diabetic nephropathy. J Am Soc Nephrol. 2008;19(3):433-442. Navarro-Gonzalez JF, Mora-Fernandez C, Muros de Fuentes M, Garcia-Perez J. 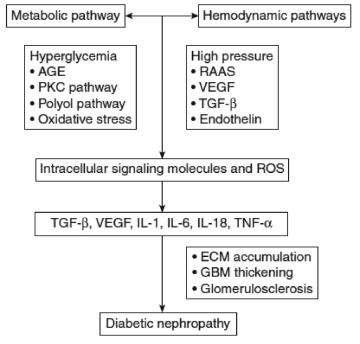 Inflammatory molecules and pathways in the pathogenesis of diabetic nephropathy. Nat Rev Nephrol. 2011;7(6):327-340. Remuzzi G, Bertani T. Is glomerulosclerosis a consequence of altered glomerular permeability to macromolecules? Kidney Int. 1990;38(3):384-394. Abbate M, Zoja C, Corna D, Capitanio M, Bertani T, Remuzzi G. In progressive nephropathies, overload of tubular cells with filtered proteins translates glomerular permeability dysfunction into cellular signals of interstitial inflammation. J Am Soc Nephrol. 1998;9(7):1213-1224. Grgic I, Campanholle G, Bijol V, et al. Targeted proximal tubule injury triggers interstitial fibrosis and glomerulosclerosis. Kidney Int. 2012;82(2):172-183. Deshpande SD, Putta S, Wang M, et al. Transforming growth factor-beta-induced cross talk between p53 and a microRNA in the pathogenesis of diabetic nephropathy. Diabetes. 2013;62(9):3151-3162. Fiorina P, Vergani A, Bassi R, et al. Role of podocyte B7-1 in diabetic nephropathy. J Am Soc Nephrol. 2014;25(7):1415-1429. Godel M, Hartleben B, Herbach N, et al. Role of mTOR in podocyte function and diabetic nephropathy in humans and mice. J Clin Invest. 2011;121(6):2197-2209. Yoo TH, Pedigo CE, Guzman J, et al. Sphingomyelinase-like phosphodiesterase 3b expression levels determine podocyte injury phenotypes in glomerular disease. J Am Soc Nephrol. 2015;26(1):133-147. Theilade S, Lyngbaek S, Hansen TW, et al. Soluble urokinase plasminogen activator receptor levels are elevated and associated with complications in patients with type 1 diabetes. J Intern Med. 2015;277(3):362-371. Hjelmesaeth J, Hartmann A, Leivestad T, et al. The impact of early-diagnosed new-onset post-transplantation diabetes mellitus on survival and major cardiac events. Kidney Int. 2006;69(3):588-595. American Diabetes Association. 15. Diabetes Advocacy: Standards of Medical Care in Diabetes-2018. Diabetes Care. 2018;41(Suppl 1):S152-S153. American Diabetes Association. Diagnosis and classification of diabetes mellitus. Diabetes Care. 2010;33 Suppl 1:S62-69. Chakkera HA, Knowler WC, Devarapalli Y, et al. Relationship between inpatient hyperglycemia and insulin treatment after kidney transplantation and future new onset diabetes mellitus. Clin J Am Soc Nephrol. 2010;5(9):1669-1675. Goldmannova D, Karasek D, Krystynik O, Zadrazil J. New-onset diabetes mellitus after renal transplantation. Biomed Pap Med Fac Univ Palacky Olomouc Czech Repub. 2016;160(2):195-200. McCaughan JA, McKnight AJ, Maxwell AP. Genetics of new-onset diabetes after transplantation. J Am Soc Nephrol. 2014;25(5):1037-1049. Tavira B, Coto E, Diaz-Corte C, et al. KCNQ1 gene variants and risk of new‐onset diabetes in tacrolimus‐treated renal‐transplanted patients. Clin Transplant. 2011;25(3):E284-E291. Peev V, Reiser J, Alachkar N. Diabetes mellitus in the transplanted kidney. Front Endocrinol (Lausanne). 2014;5:141. Sumrani NB, Delaney V, Ding ZK, et al. Diabetes mellitus after renal transplantation in the cyclosporine era--an analysis of risk factors. Transplantation. 1991;51(2):343-347. Nagib AM, Refaie AF, Akl AI, et al. New onset diabetes mellitus after living donor renal transplantation: a unique pattern in the Egyptian population. J Diabetes Meta. 2015;6:519.
de Mattos AM, Olyaei AJ, Prather JC, Golconda MS, Barry JM, Norman DJ. Autosomal-dominant polycystic kidney disease as a risk factor for diabetes mellitus following renal transplantation. Kidney Int. 2005;67(2):714-720. Prasad GV, Kim SJ, Huang M, et al. Reduced incidence of new-onset diabetes mellitus after renal transplantation with 3-hydroxy-3-methylglutaryl-coenzyme a reductase inhibitors (statins). Am J Transplant. 2004;4(11):1897-1903. Roland M, Gatault P, Al-Najjar A, et al. Early pulse pressure and low-grade proteinuria as independent long-term risk factors for new-onset diabetes mellitus after kidney transplantation. Am J Transplant. 2008;8(8):1719-1728. Fabrizi F, Martin P, Dixit V, Bunnapradist S, Kanwal F, Dulai G. Post-transplant diabetes mellitus and HCV seropositive status after renal transplantation: meta-analysis of clinical studies. Am J Transplant. 2005;5(10):2433-2440. Wang Q, Chen J, Wang Y, Han X, Chen X. Hepatitis C virus induced a novel apoptosis-like death of pancreatic beta cells through a caspase 3-dependent pathway. PLoS One. 2012;7(6):e38522. Einollahi B, Motalebi M, Salesi M, Ebrahimi M, Taghipour M. The impact of cytomegalovirus infection on new-onset diabetes mellitus after kidney transplantation: a review on current findings. J Nephropathol. 2014;3(4):139-148. Penfornis A, Kury-Paulin S. Immunosuppressive drug-induced diabetes. Diabetes Metab. 2006;32(5 Pt 2):539-546. Luan FL, Steffick DE, Ojo AO. New-onset diabetes mellitus in kidney transplant recipients discharged on steroid-free immunosuppression. Transplantation. 2011;91(3):334-341. Bloom RD, Crutchlow MF. New-onset diabetes mellitus in the kidney recipient: diagnosis and management strategies. Clin J Am Soc Nephrol. 2008;3 Suppl 2:S38-48. Busque S, Cantarovich M, Mulgaonkar S, et al. The PROMISE study: a phase 2b multicenter study of voclosporin (ISA247) versus tacrolimus in de novo kidney transplantation. Am J Transplant. 2011;11(12):2675-2684. Miller J, Mendez R, Pirsch JD, Jensik SC. Safety and efficacy of tacrolimus in combination with mycophenolate mofetil (MMF) in cadaveric renal transplant recipients. FK506/MMF Dose-Ranging Kidney Transplant Study Group. Transplantation. 2000;69(5):875-880. Vattam K, Khan I, Movva S, et al. IGF2 ApaI A/G polymorphism evaluated in ESRD individuals as a biomarker to identify patients with new onset diabetes mellitus after renal transplant in Asian Indians. Open J Nephrol. 2013;3(2):104-108. Heldal TF, Ueland T, Jenssen T, et al. Inflammatory and related biomarkers are associated with post-transplant diabetes mellitus in kidney recipients: a retrospective study. Transpl Int. 2018;31(5):510-519. Diabetes Prevention Program Outcomes Study Research Group, Orchard TJ, Temprosa M, et al. Long-term effects of the Diabetes Prevention Program interventions on cardiovascular risk factors: a report from the DPP Outcomes Study. Diabet Med. 2013;30(1):46-55. Tarnowski M, Sluczanowska-Glabowska S, Pawlik A, Mazurek-Mochol M, Dembowska E. Genetic factors in pathogenesis of diabetes mellitus after kidney transplantation. Ther Clin Risk Manag. 2017;13:439-446. Vattam KK, Movva S, Khan IA, et al. Importance of gene polymorphisms in renal transplant patients to prevent post transplant diabetes. J Diabetes Metab. 2014;5:463. Perkins BA, Ficociello LH, Roshan B, Warram JH, Krolewski AS. In patients with type 1 diabetes and new-onset microalbuminuria the development of advanced chronic kidney disease may not require progression to proteinuria. Kidney Int. 2010;77(1):57-64. Perkins BA, Ficociello LH, Ostrander BE, et al. Microalbuminuria and the risk for early progressive renal function decline in type 1 diabetes. J Am Soc Nephrol. 2007;18(4):1353-1361. Macisaac RJ, Ekinci EI, Jerums G. Markers of and risk factors for the development and progression of diabetic kidney disease. Am J Kidney Dis. 2014;63(2 Suppl 2):S39-62. Skupien J, Warram JH, Smiles A, Galecki A, Stanton RC, Krolewski AS. Improved glycemic control and risk of ESRD in patients with type 1 diabetes and proteinuria. J Am Soc Nephrol. 2014;25(12):2916-2925. Fioretto P, Steffes MW, Sutherland DE, Goetz FC, Mauer M. Reversal of lesions of diabetic nephropathy after pancreas transplantation. N Engl J Med. 1998;339(2):69-75. Zoungas S, Chalmers J, Ninomiya T, et al. Association of HbA1c levels with vascular complications and death in patients with type 2 diabetes: evidence of glycaemic thresholds. Diabetologia. 2012;55(3):636-643. Wada Y, Abe M, Moritani H, et al. Original Research: Potential of urinary nephrin as a biomarker reflecting podocyte dysfunction in various kidney disease models. Exp Biol Med (Maywood). 2016;241(16):1865-1876. American Diabetes Association. Standards of medical care in diabetes--2008. Diabetes Care. 2008;31 Suppl 1:S12-54. Molitch ME, DeFronzo RA, Franz MJ, et al. Diabetic nephropathy. Diabetes Care. 2003;26 Suppl 1:S94-98. McGowan TA, Ziyadeh FN. Clinical Course and Management of Diabetic Nephropathy. In: Greenberg A, ed. Primer on Kidney Diseases, 4th ed. Philadelphia, PA: Saunders; 2005:243-244. Nathan DM, Buse JB, Davidson MB, et al. Medical management of hyperglycemia in type 2 diabetes: a consensus algorithm for the initiation and adjustment of therapy: a consensus statement of the American Diabetes Association and the European Association for the Study of Diabetes. Diabetes Care. 2009;32(1):193-203. Polonsky WH, Earles J, Smith S, et al. Integrating medical management with diabetes self-management training: a randomized control trial of the Diabetes Outpatient Intensive Treatment program. Diabetes Care. 2003;26(11):3048-3053. Mayo A. Orem’s Self-Care Model: A Professional Nursing Practice Model; 1997. Toljamo M, Hentinen M. Adherence to self-care and glycaemic control among people with insulin-dependent diabetes mellitus. J Adv Nurs. 2001;34(6):780-786. Shibayama T, Kobayashi K, Takano A, Kadowaki T, Kazuma K. Effectiveness of lifestyle counseling by certified expert nurse of Japan for non-insulin-treated diabetic outpatients: a 1-year randomized controlled trial. Diabetes Res Clin Pract. 2007;76(2):265-268. Karakurt P, Kasikci MK. The effect of education given to patients with type 2 diabetes mellitus on self-care. Int J Nurs Pract. 2012;18(2):170-179. Gaston RS, Basadonna G, Cosio FG, et al. Transplantation in the diabetic patient with advanced chronic kidney disease: a task force report. Am J Kidney Dis. 2004;44(3):529-542. Bergrem HA, Valderhaug TG, Hartmann A, et al. Undiagnosed diabetes in kidney transplant candidates: a case-finding strategy. Clin J Am Soc Nephrol. 2010;5(4):616-622. Kidney Disease: Improving Global Outcomes Transplant Work Group. KDIGO clinical practice guideline for the care of kidney transplant recipients. Am J Transplant. 2009;9 Suppl 3:S1-155. Yates CJ, Fourlanos S, Hjelmesaeth J, Colman PG, Cohney SJ. New-onset diabetes after kidney transplantation-changes and challenges. Am J Transplant. 2012;12(4):820-828. Chakkera HA, Weil EJ, Pham PT, Pomeroy J, Knowler WC. Can new-onset diabetes after kidney transplant be prevented? Diabetes Care. 2013;36(5):1406-1412. Juan Khong M, Ping Chong C. Prevention and management of new-onset diabetes mellitus in kidney transplantation. Neth J Med. 2014;72(3):127-134. Umanath K, Lewis JB. Update on Diabetic Nephropathy: Core Curriculum 2018. Am J Kidney Dis. 2018;71(6):884-895.